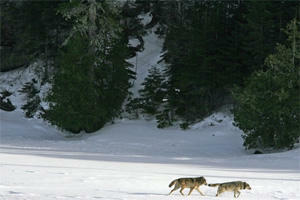 It’s the 56th year of the study of Isle Royale’s wolves and moose. Researchers at Michigan Tech have just finished this year’s Winter Study. Rolf Peterson is a research professor at Michigan Tech and he just spent his 44th winter on the island. I called him up to find out how the animals are doing. This year, the team counted nine wolves, up from eight last year. The moose, on the other hand, are having a field day. "They're on vacation now, with wolves so low. Wolves are sort of taken off the table so the moose population is increasing right along with the wolf decline." He says there are a little over a thousand moose on Isle Royale. 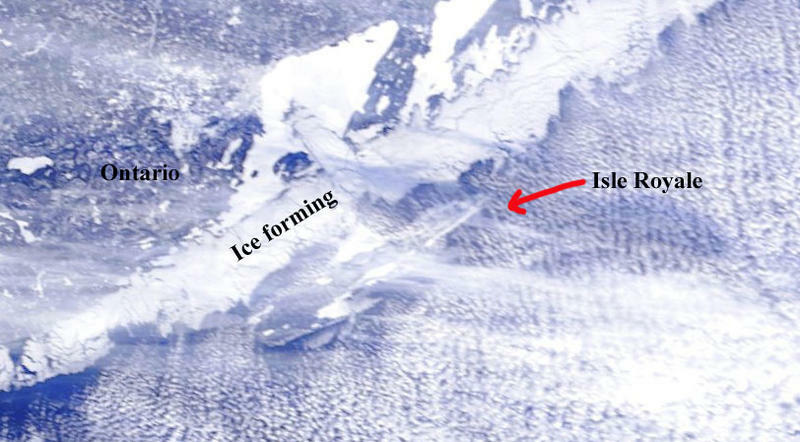 With climate change, there are fewer ice bridges forming from the mainland. This year, an ice bridge did form, but instead of new wolves coming to the island, as some people were hoping, one wolf left, and she was shot when she got to Minnesota. “It took one prime breeding female off the table. She’s gone. She thought she was doing the right thing. She’d been trying to find an appropriate mate for at least two years and things weren’t working out very well for her. So on the first chance she had to leave Isle Royale, she took off,” says Peterson. A few weeks ago, the National Park Service announced it would not bring new wolves to the island for now. Peterson says he was disappointed to hear the decision. He says there's no way to predict how long the island's wolves will hang on without intervention: he says they could collapse very quickly, or they might hang on for several years. TRAVERSE CITY, Mich. (AP) - A scientist says one of the few remaining gray wolves of Isle Royale National Park has been found dead after escaping to the mainland across a Lake Superior ice bridge. Michigan Technological University biologist Rolf Peterson tells The Associated Press on Tuesday that the 5-year-old female's body was discovered this month along the lakeshore on the Grand Portage Indian Reservation in northeastern Minnesota. Peterson says the wolf wore a radio collar and its serial numbers confirmed her identity. Scientists had nicknamed her "Isabelle." The cause of her death is unknown. Peterson says she apparently wasn't shot. She was wounded last year in attacks by other wolves. 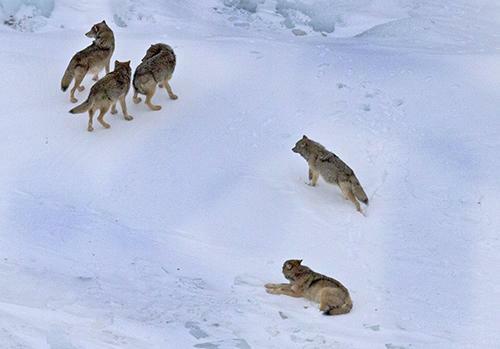 Scientists hoped that mainland wolves would migrate to Isle Royale across ice bridges this winter but none have. The island's population now totals nine. 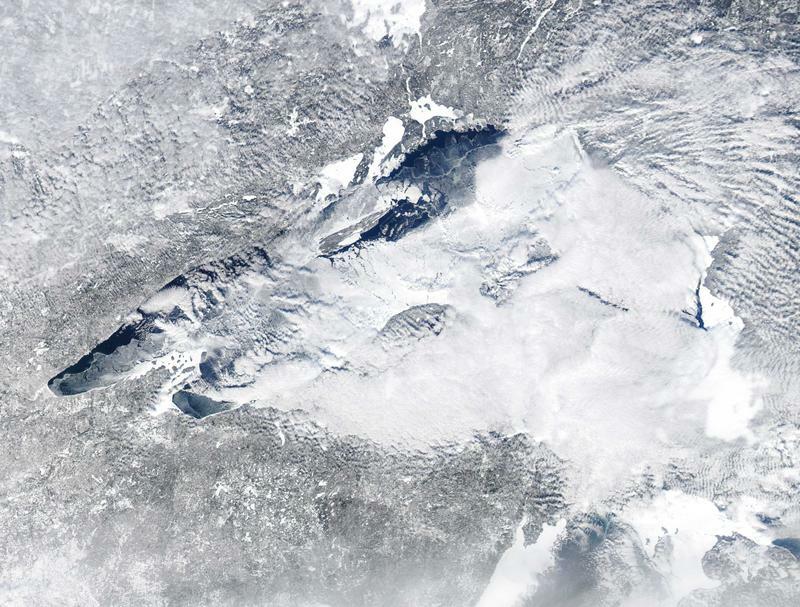 The ice bridge to Isle Royale has formed. See our post here. Wolves first came to Isle Royale in Lake Superior by crossing an ice bridge in the late 1940s, but these ice bridges have not been forming as often in recent years and the wolf population on Isle Royale has been suffering as a result. A wolf that fled from Isle Royale National Park over an ice bridge was found dead on the Minnesota mainland last month. Researchers were unsure how the wolf died at the time, but a necropsy found that the five-year-old female wolf was shot with a pellet gun. Ice bridge to Isle Royale is complete, will new wolves cross it? The last time I checked, the ice bridge to Isle Royale had not fully formed, but there's an ice bridge now. Michigan Technological University's Rolf Peterson confirmed it in an e-mail to me last night. "There's been a good ice bridge for the past 10 days."